You probably know someone just like him. He works two jobs, one installing granite countertops and the other selling houses, just to scrape by in a tiny house with his loving family. He is a devoted dad, who got married and had three kids all in the span of five years, and quickly found himself in over his head in debt. He’s hilarious; the life of every party, though he doesn’t drink and is constantly gushing about how lucky he is. He’s an incurable optimist, and is determined to do right by his family, the cogs in his head clearly turning constantly. This was ShayCarl, known to his friends and family as Shay Butler, the day he uploaded his first video to YouTube. He lived in a small home with his wife, two daughters and his son, and struggled to make ends meet. Not so computer savvy, the granite installer bought his first computer for just over $400 and sat in awe of the community he quickly discovered on YouTube. In the beginning, the short, silly clips Shay uploaded to YouTube earned him a couple of hundred devoted followers. He was shocked at the fact that people actually wanted to watch him and when he got his first email from a viewer asking for more videos, he decided he would put more time into it. Shay began uploading short videos each day of his family. This was one of the pioneering efforts in what is now known as “vlogging” - a video form where users film their day-to-day lives, edit the footage down to shorter, more consumable videos and post them to YouTube. 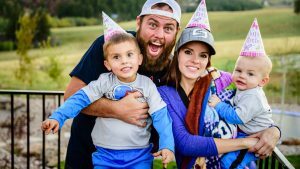 In no time at all, the YouTube community began to fall in love with the “Shaytards” - a name that came from Shay’s first video featuring him dancing around in his wife’s unitard. Giving his kids names like Babytard, Sontard and Princesstard, he and his wife presented their family as they are: fun-loving, hilarious, strange and absolutely watchable. His viewership grew, and he began to amass subscribers on the video platform faster than he could keep track of. Suddenly, money appeared, earned from the cost per impression and per click ads that are served up alongside YouTube videos. He knew he had to be smart about this new source of income, so he set his sights on paying off his debts and expanding his reach on YouTube. When the YouTube money began to exceed his paychecks, he knew he had to quit his granite work and spend more time focusing on YouTube. In 2009, Shay, with the help of other YouTubers he’d gotten to know, started Maker Studios - a network of YouTube channels that focused on humor, parodies and comedy sketches. His reach was growing exponentially, and in 2010, when Shay and his wife, Collette, had their fourth child, the video announcing his birth was watched by many multiple millions of his devoted viewers and followers, who, by now, all felt like they were some small part of this happy family. They had paid off $195,000 of debt in four years. In 2013, Colette and Shay welcomed another son into their lives and then in 2014, Shay sold Maker Studios to Disney for $500 million. Shay has expanded his empire to include a popular podcast, documentaries and multiple YouTube channels that make money faster than a mint. He now has over two and a half billion views on just one of his YouTube channels. Have you watched any of Shay Carl’s videos? What did you think?